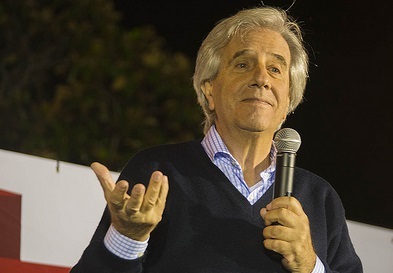 The Frente Amplio (FA) emerged from Sunday’s general elections in Uruguay looking stronger than observers had forecast – and signaling Latin Americans’ confidence in the center-left. Despite a rough campaign season, which included polls showing the FA’s support stuck in the low 40s, and public sniping between the party’s leaders – candidate Tabaré Vázquez and current president José Mujica – just days before the election, the FA gained last-minute momentum in the polls and won 47.9 percent of the vote. As expected, Vázquez received less than the outright majority needed to avoid a second round of voting on November 30 against the candidate of the Partido Nacional (PN), Luis Lacalle Pou, who won 31 percent of the vote. But the FA preserved its majority in the lower chamber of parliament, and it can have the edge in the senate if Vázquez wins in November, as his vice president, Raúl Séndic, would hold the deciding vote. The Partido Colorado (PC) candidate, Pedro Bordaberry, won only 12.9 percent of the vote and placed third in every department. The elections revolved around Vázquez and Lacalle Pou’s leadership identity and policies; neither candidate argued for substantial structural changes. In exit interviews, those who voted for the FA credited it with positive changes in its decade at the helm. The 41-year-old Lacalle Pou has run as a youthful leadership alternative to the 74-year-old former president Vázquez, and he promised fresh ideas for taking on crime and education, considered leading concerns for Uruguayan voters. While exit interviews suggest that this message appealed to his party’s voters, it did not translate into substantial youth support. Polling by Factum prior to the election showed that 51 percent of voters aged 18-37 preferred the FA. Public security has been the leading concern for Uruguayan voters, and both traditional center-right parties, the PN and PC, supported a referendum (also held on Sunday) that would have lowered the age of criminal responsibility for major crimes from 18 to 16. But long-term polling trends have shown a decrease in the number of Uruguayans prioritizing security from its peak last year, and indeed the referendum failed with 47 percent of the vote; almost the entirety of undecided voters ultimately chose to oppose it. The FA now has momentum and is well positioned to win the second round and enjoy the support of a parliamentary majority. A likely PN-PC voting bloc in the second round once held a slight lead over the FA but now appears likely to fall short because of tensions between them. The PC’s underwhelming performance at the polls has been compounded by Bordaberry’s decision on Sunday night to support Lacalle Pou without consulting PC officials, and his offensive off-the-cuff verbal attack on the Vázquez camp during a conversation with a PN official that same night, for which he has since apologized. The left-leaning Partido Independiente, which came in fourth place with 3.1 percent of the vote, will make a decision on which candidate to support this week; their votes alone would be enough to push the FA over the top. 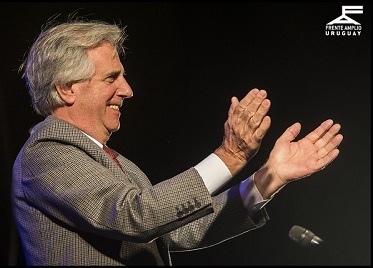 As a result, barring a major turn of events, it appears as though the incumbent pink tide will prevail in Uruguay – with implications, perhaps, beyond. Indeed, a second-round FA victory will be the sixth this year for a left-leaning party, following the pattern set by Chile, Costa Rica, El Salvador, Bolivia, and Brazil. While the citizenry may be impatient with the pace of progress in Latin America following nearly a decade of left-leaning governance, voters seem to be eschewing the right and maintaining the modestly but consistently leftward tilt that has characterized the region’s politics for much of the 21st century.